Of all the towns in the world, Mesquite has made the cut for a series of ads from PETA. The animal welfare organization has placed several ads near the H&M and Macy's stores in Mesquite's Town East Mall showing different animals alongside the message, "Wear Something Vegan." According to a release, the goal of the campaign is to urge shoppers to steer clear of items made from fur, leather, wool, and down. The ads will be in place for the fall shopping season. One shows a group of cows with the words, "We're Individuals. We're Not Shoes or Belts. Wear Something Vegan." There are also ads showing a mother fox and her baby, a sheep, and two geese, who remind shoppers that they are "Not Down Jackets." In a release, PETA campaign manager Christina Sewell says that the ads are designed to "encourage shoppers to leave items that stripped animals of their lives on the rack and opt for chic and compassionate vegan clothing instead." PETA has done video exposés of the wool industry revealing that sheep are beaten, mutilated, and even skinned alive, and of the down industry in China showing workers pluck geese and duck feathers several times a year before leaving them to die slowly. The organization has also been lobbying both H&M and Macy's to stop selling animal skins and fur. Town East has locations of both retailers. Little ol' Mesquite joins a series of targeted campaigns PETA has launched in the past month, along with New York City, Syracuse, Baltimore, and Cabazon, California. 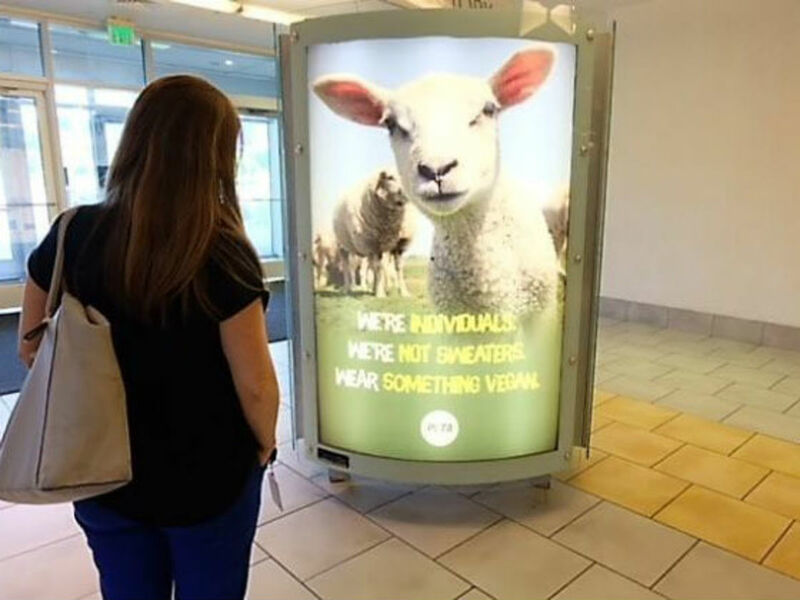 "PETA's 'Wear Something Vegan' ads were strategically placed at the Town East Mall in Mesquite because the mall is a destination shopping center for locals and tourists visiting the Dallas area," a PETA spokesperson says. "In addition, the mall features H&M and Macy's stores, which continue to sell leather and fur, respectively, among other animal-derived materials, despite hearing from PETA how animals are abused and killed by the billions in the fashion industry every year." The ads all share a theme of seeing animals as individuals, which has been shown to increase empathy. PETA recently enjoyed a success after it encouraged Nabisco to change the packaging on its animal crackers. The animals were previously pictured in cages, but are now a free-standing group. But they're still called "Barnum's Animals," even though the circus folded in 2017.